I’ll say it loud and clear: I love traveling. Not just the kind where you take a vacation for two weeks to escape reality, but the kind where you roam the world for a year until traveling becomes your reality. For most of us, though, this isn’t easy or practical. We’ll eventually run out of funds. We’re afraid of coming home without work prospects. We’re afraid of gaps in our resume. Every traveler should post regularly on blogs and social media. While it’s true that competition is high with the millions of travel bloggers out there, it’s also true that you don’t have to be an Instagram celebrity to make money from your posts. You can drive visitors to your pages by writing and posting about tips they might find useful, like travel advice and itinerary suggests for particular regions of the world. On WordPress, for example, you can create a blog, and even a professional site, with downloadable travel guides that will build your credibility as a travel blogging professional. And on URIJI, you can connect with like-minded travelers and post videos about your adventures. You can also use the platform to sell your videos and get donations from people who support your passions and who want to learn from your experiences. While it takes time and resources to make blogging and social media your primary business outlets, these activities are always worthwhile. Even if they aren’t earning you money now, they might earn you money later, and you’ll be happy to have them in your professional portfolio down the road. If reliance on blogging alone sounds intimidating, remember: there are tons of companies who are happy to pay you for individual articles. This is particularly true once you have enough blog posts to showcase your writing portfolio. There are plenty of sites, such as Upwork, that you can use to search for opportunities and build your career as a freelancer. While freelancing doesn’t guarantee you a steady income, it’s become much easier as sites have popped up to connect business and freelancers. I’ve seen lots of travelers having the time of their lives writing on their laptop from the beach. 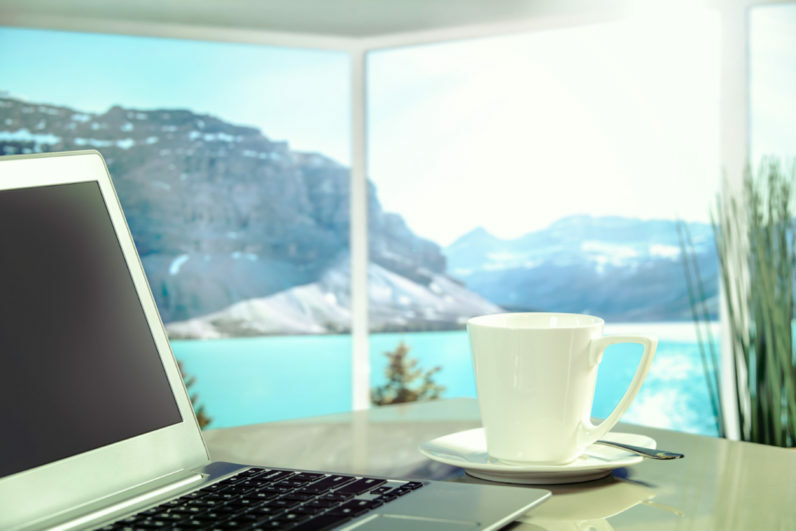 Freelancing, combined with blogging and posting on social media, can jumpstart your career as a writer-traveler. You’ve probably rented an Airbnb, but have you ever tried renting one out? Managing multiple listings on Airbnb and other sites is a perfect business for long-term travelers who can rent out their own homes, who already own vacation property, or who have the extra cash to invest in additional rental units. While managing rental units is challenging work, it has become a lot easier in the past few years as automation has taken over the Airbnb industry. Guesty, for example, has a mobile app that syncs rental data, listing calendars, and guest messages across different booking platforms. Such automation platforms allow you to manage your properties remotely, regardless of your time zone, and without having to be present in-person for guests. If your goal is to make a living while traveling, your first instinct might be to search for ways to make an income. But I’ve met many fellow travelers who’ve successfully removed themselves from the money system while still living comfortably. There are plenty of opportunities to work in exchange for food and accommodation. For those who aren’t concerned about sightseeing everyday, spending your days working while abroad can give you a new perspective on the country and the culture. This style of working is particularly good for people who travel for a full year, or who’ve committed themselves to several years of traveling. So what kinds of opportunities are there? One option is the WWOOF program, which lets you live and work on small farms worldwide in exchange for food and housing. While WWOOFers used to have to carry around a book for the list of local opportunities, the program now offers users an app. The app, which is compatible with multiple operating systems, regularly updates its list of hosts, making it easier and more reliable to find available work opportunities. Working a part-time to full-time job will take away from your leisure time, and they certainly won’t help you up the numbers in your bank account. Nonetheless, they’ll reduce your spending while offering a deep cultural experience that mere sightseeing does not. While you work, you’ll get to hang out with cool people from all over the world. For those who prefer the road less traveled, there are plenty of ways to make a living while traveling. Though traditionally deemed ‘unrealistic’ or ‘impractical,’ technology has made it increasingly easy to become an entrepreneur abroad and work at your own pace. Working abroad isn’t just about sightseeing; it’s about thinking outside the box, pursuing your passions strategically, and becoming your own boss.